Winner of this year's Man Booker International Prize for her extraordinary book Flights, Polish author Olga Tokarczuk visits the Twin Cities for a special event. 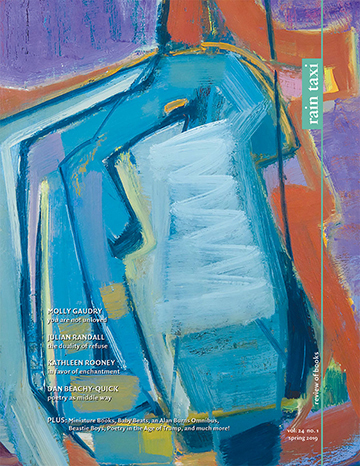 Co-sponsored by Rain Taxi Review of Books and the Polish American Cultural Institute of Minnesota, with book sales by Milkweed Books. If you are an individual with disabilities, please let us know if you require any special accommodations to enjoy this event—write us at info [at] raintaxi [dot] com. Olga Tokarczuk is one of Poland’s best and most beloved authors. She recently became the first Polish author to win the Man Booker International Prize, and she has twice received Poland’s highest literary award, the Nike, as well as numerous other prizes. Trained as a Jungian psychologist,Tokarczuk is the author of eight novels and two short story collections, and has been translated into a dozen languages. 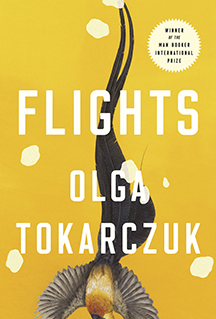 From the incomparably original Polish writer Olga Tokarczuk, Flights (Riverhead Books), translated into English by Jennifer Croft, interweaves reflections on travel with an in-depth exploration of the human body, broaching life, death, motion, and migration. Chopin’s heart is carried back to Warsaw in secret by his adoring sister. A woman must return to her native Poland in order to poison her terminally ill high school sweetheart, and a young man slowly descends into madness when his wife and child mysteriously vanish during a vacation and just as suddenly reappear. Through these brilliantly imagined characters and stories, interwoven with haunting, playful, and revelatory meditations, Flights explores what it means to be a traveler, a wanderer, a body in motion not only through space but through time. Where are you from? Where are you going? Enchanting, unsettling, and wholly original, Flights is a master storyteller’s answer. This entry was posted in Uncategorized on August 14, 2018 by Kelly.